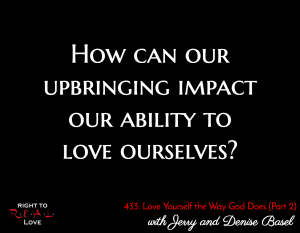 In this episode, Jay continues his discussion with authors Jerry and Denise Basel by addressing the question: How can our upbringing impact our ability to love ourselves? How can our upbringing impact our ability to love ourselves? Why we all need to receive the things that God intended for us in life. How our upbringing can affect our ability to love ourselves. The importance of addressing the hurt we experience as children. Acknowledge that you deserve to love yourself the way God loves you and He desires for you to love yourself that much too. Surrender and tell God that you want all that He has for you. Get the Missing Commandment: Love Yourself book and embark on the journey of loving yourself the way that God loves you. DUMP YOUR BAGGAGE: Discover how to enter your next relationship at your best!